FingerTec Door Access readers can be paired with FingerTec AdapTec Plus/Adaptec X with electromagnetic locks to secure your premises’ door. These locks have a built-in safety feature that will disable the lock during emergencies. The designs and type of electromagnetic locking systems vary with the type and usage of the doors on which they are installed. A single AdapTec Plus/Adaptec X can provide power to a maximum of 2 units of FingerTec terminals and 2 sets of door lock accessories such as EM Lock and drop bolt in one single system installation simultaneously for a cost effective access control system suitable for small and medium sized offices. However, there are rare instances where the EM Lock just won’t open due to some reason. The process below explains what can be done to troubleshoot the problem. 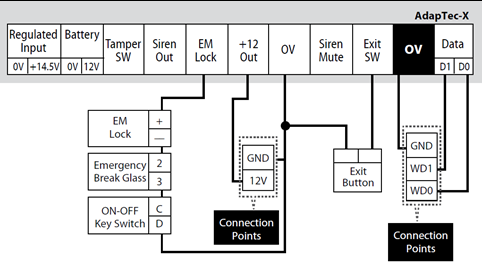 To troubleshoot the electromagnetic lock that won’t open during verification, follow the steps below. Connect a Push Button on the AdapTec Controller to test whether the EM Lock can open when the push button is pressed. If the EM Lock still fails to open when the push button is pressed, proceed to Step 2. 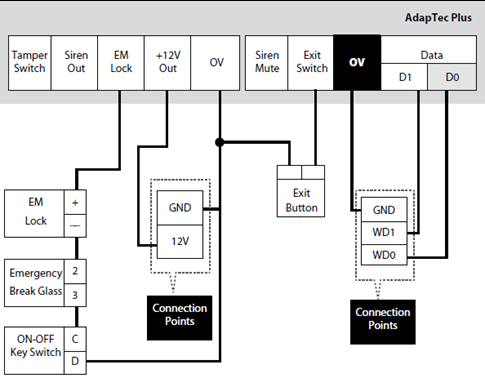 Check the Wiegand wiring between the Device and Adaptec Controller, and ensure that the correct ports are used (D0, D1 and GND). Also, check the condition of the cables (you can use the continuity test to check the cables). If the EM Lock still does not release, update the device’s firmware. You can use the device info tool (http://www.fingertectips.com/2014/01/how-to-use-fingertec-device-info-tool.html) to check the platform version to avoide updating the wrong firmware to your device. Be sure that the settings in the device has been turned on. For R2 and Kadex, go to Menu > Option > Comm Opt > Adaptec Plus > Change to Y. For other models besides R2 and Kadex, you can turn on the function by using the FT Function Tools which can be obtained here http://www.fingertec.com/FTtool/FT_tool.html. Insert the device’s IP Address > Click Connect > check the Adaptec Plus Box > select ON > Update > Restart. If all the steps above still failed to release the EM lock, we can confirm that the AdapTec is faulty. You can proceed to claim warranty to get a replacement unit if it is still under warranty. types which correspond its specific use. I had an issue once with new R2 devices not releasing the magnet and I did to make them work was to do a Options reset. After doing it, both devices worked!